Politicans Public Officials Debate Public Lands | RANGEfire! The national head of the Bureau of Land Management testified Wednesday before a congressional committee in Washington, DC, that his agency could not support a massive public lands bill for Utah because of how it handles energy development on federal lands and its multiple land trades. “I am not aware of a precedent where the state has been given primacy over energy development. Not only is it unusual, but it is highly problematic,” Kornze told members of the House Natural Resources’ federal lands subcommittee during a hearing in Washington, D.C.
Bishop’s public lands initiative, or HR5780, has been three years in the making and attempts to settle divisive conflicts on 18 million acres of land in seven eastern Utah counties. Bishop shot back at Kornze and his criticism of the energy provision in the massive bill, emphasizing the measure seeks to accomplish what federal land agencies have not: effective and responsive management of public lands. Among those testifying for the bill were Dave Ure, executive director of the Utah School and Institutional Trust Lands Administration, which hopes to consolidate more than 300,000 acres of scattered land sections through Bishop’s bill. Ure pleaded with subcommittee members to “pass it along” for the benefit of trust land beneficiaries — or schoolchildren — who would gain from the consolidation of scattered land holdings through potential development revenue. 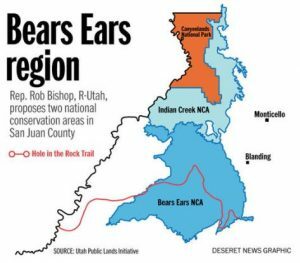 While multiple members of the subcommittee brought up the abundance of concerns raised by environmental groups over the bill’s provisions, San Juan County Commissioner Rebecca Benally — a Navajo — said Bishop’s proposed establishment of a national conservation area for the Bears Ears region is preferred by locals rather than a monument designation by President Barack Obama. “Bears Ears National Monument campaign is a cynical political stunt that if successful will deny grass-roots Utah Navajo access to their sacred and spiritual grounds,” she testified. But Regina Lopez-Whiteskunk, co-chairwoman of the Bears Ears Inter-Tribal Coalition, said Bishop’s bill would turn federal land management back 100 years and ensure continued desecration of sacred sites. Rep. Raul Grijalva, D-Ariz., was an especially harsh critic of the public lands initiative. “It is an unprecedented giveaway of Native American assets that should be opposed,” he said. 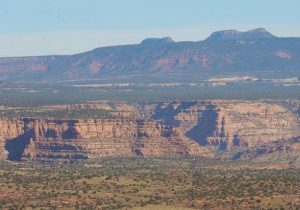 The looming possibility of a national monument designation for the Bears Ears region before Obama leaves office has fostered contentious discussion throughout the state and particularly in San Juan County. “Everybody agrees it should be preserved. The question is do we do it with a scalpel with the PLI or do you do it with an ax or chainsaw with a national monument?” Ure said. The push by the Bears Ears Inter-Tribal Coalition for a monument designation of 1.9 million acres prompted a July visit to Utah by Interior Secretary Sally Jewell, as well as Kornze and other key land managers in the Obama administration. Rep. Jason Chaffetz, R-Utah and co-sponsor of the bill, said the Public Lands Initiative is the only viable, nonpartisan solution that will work for Utah. “We have bent over backward to accommodate everyone as much as we can,” he said. Chaffetz said he believes the Public Lands Initiative can work for Utah — despite the din of condemnation from environmental groups and conservation organizations — and there is still time for Congress to act. “Let the locally driven process prevail,” he told the subcommittee. Scott Groene, director of the Southern Utah Wilderness Alliance, attended the hearing and has described Bishop’s bill as a terrible measure that will set conservation back years. While it proposes to create 41 new wilderness areas and establishes 11 national conservation areas in Utah, Groene and other critics complain the bill contains too many deleterious provisions, such as keeping grazing at status quo levels, too many allowances for off-highway vehicle use and the promotion of energy development in high-value recreation areas. Clif Koontz, program director for Ride With Respect, an off-road group, said the bill is an unhappy compromise for his members and not a giveaway for new trails or routes for all-terrain vehicle or dirt bike enthusiasts. Bishop unveiled a retooled version of his massive public lands bill in July, incorporating revisions that added 300,000 more acres for conservation, increasing the stretches of rivers for wild, scenic or recreational designations and taking so-called “energy development zones” off the table. The bill does not bypass federally required environmental reviews for potential drilling or other natural resource extraction, but it does give the state of Utah the authority to expedite the permitting process. Bishop said the bill still allows the BLM to conduct its environmental reviews, but it when it comes to the actual permitting, Utah would take over. Environmental groups say that toss to the state gives industry a free pass for unfettered exploitation of natural resources, but Bishop stressed that Utah and other states have a more competent and streamlined approach for oil and gas development that is not hindered by bureaucratic backlogs. The state-permitting model is drawn from the Interstate Oil and Gas Commission proposal that increases state involvement in the permitting process, he said. Because Utah’s energy landscape is dominated by federal land ownership, Bishop said the state can’t compete with counterparts like North Dakota, Oklahoma or Texas where industry is not stymied by lengthy wait times. Rep. Cynthia Loomis, R-Wyoming, said her state has been so impressed with the thought and effort behind the initiative that it is embarking on its own version to solve public land disputes. “The proposal that Chairman Bishop has put forward is heading in the right direction,” she said. She added that she believes the condition of public lands demands a sea change in management. She said creating more national monuments is the “worst” thing that could happen to public lands, continuing a legacy of benign neglect that impairs forests’ health, watersheds and other ecosystems. Bishop said he didn’t expect his bill to be without detractors because it is full of compromises designed to give everyone something, but no one everything. “There are shrill voices out there who realize if we bring finality to this issue they will be out of work,” he told the subcommittee. Afterward, he said the subcommittee hearing bolsters his optimism that he can bring his bill to the floor for a vote.